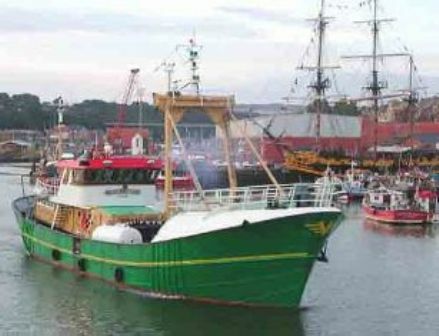 A former Dutch Beam trawler built in 1968, the Ocean Dancer is worthy of its own pages as it features only briefly on my Clive Cussler pages. I have become accustomed to seeing the Ocean Dancer as it arrives on its annual pilgrimages to Whitby. Since its first arrival in 2003 I have built up a good relationship with the ships skipper John Mayo Owens and I am pleased to be welcomed aboard when the ship is in the harbour. The photograph to right was taken during one of the early expeditions, whilst the recompression chamber can still be seen on the deck. For those that have not read the pages I have dedicated to Clive Cussler it is only fair that I explain the Ocean Dancer is the chosen charter vessel for his expeditions to find the location of the Bonhomme Richard but that is only a glimpse of the activities the vessel undertakes. On the 23rd September, 1779 one of the fiercest battles of the Revolutionary War took place off the coast of Flamborough Head, England between the Bonhomme Richard and H.M.S. Serapis. The Bonhomme Richard was commanded by John Paul Jones who is often considered to be the father of the United States Navy. The battle between the two ships is said to have taken took place at point blank range lasting almost three and a half hours. John Paul Jones emerged from the battle victorious and captured the Serapis as his prize. Thirty six hours after taking command of the Serapis, John Paul Jones watched the Bonhomme Richard sink below the cold dark waters of the North Sea. The high level of electronic wheelhouse equipment can be supplemented to depending on specific charters. In her present role looking for the location of the Bonhomme Richard remains the vessel carries a sophisticated side scan sonar set up. The ship has played host to Mike and Warren Fletcher and a plethora of video equipment. The recovery inflatable is pretty much a given aboard any charter vessel and has seen its fair share of skippers. In the past the vessel has met the needs of extreme diving charters including the "Carpathia" off the Irish Coast. To do so the ship was equipped with extra equipment in clean air compressors and mixed gas cylinders. Ocean Dancer is always well equipped with safety equipment including its own recompression chamber, something normally the domain of more sophisticated vessels. This page would not be complete without presenting a selection of photographs in a series of Ocean Dancer gallery pages. The first gallery page presents some of my favourite Ocean Dancer images, whilst the next has selected photographs captured inside the vessel showing the accommodation and dive support equipment. The next gallery presents photographs of the vessel's outside including more hull shots, her bridge and engine room equipment. In 2008 I was made aware of the Ocean Dancer being placed up for sale putting her involvement in the Bonhomme Richard expeditions under jeopardy this simple page reveals some surprising developments. To complete the series of gallery pages I have added another gallery page, this one presenting the Ocean Dancer as she was prior to undergoing a major conversion to enclose her stern, showing the vessel in quite a different form.